Can you imagine how easy serging could be if you didn't have to thread the serger? Look no further than the Juki MO 1000 with Jet-Air threading technology. The Juki MO 1000 threads the loopers with the push of a button! Thread is sent directly through Juki Overlock MO 1000 tubular loopers. This eliminates threading mistakes and protects the thread. There are no thread guides, no struggling, and no frustration with the Juki MO 1000. Effortless threading with the power of air! Serge like a pro with ease! 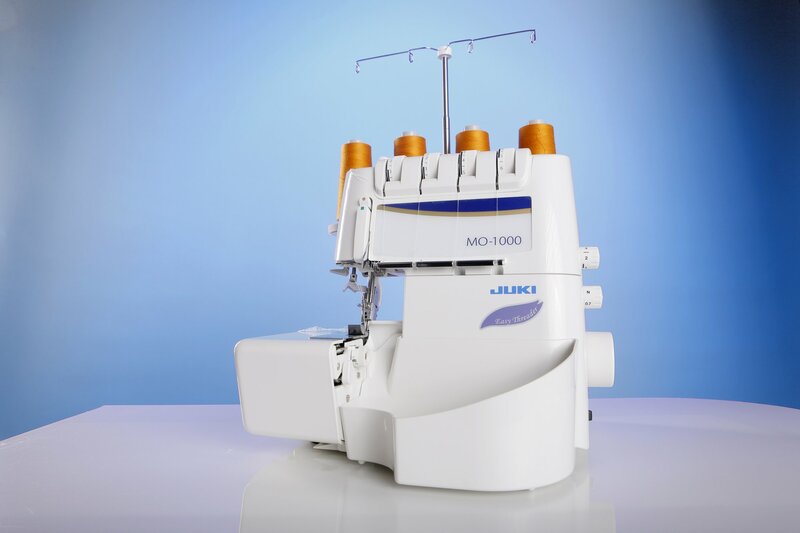 Juki MO 1000 Serger 2-Needle, 2/3/4-Thread Overlock with Easy Threader and Differential Feed. Adjustable Differential Feed - Even with easily stretched fabrics such as knits and georgette, create beautifully sewn finishes by adjusting the differential feed. Beautiful Sharp Curve - The distance between the needle and knife is 9.95mm (conventional model: 15.5mm), allowing you to sew beautiful inside curves. Upper Looper Converter 2-/3- Thread Conversion - Switch to 2-thread sewing simply by pushing the 2-/3-thread changeover attachment to the left, making this operation even easier. Wide Throat Area - The height of the throat is 72.4mm, creating an easy-to-use, spacious workspace. Quiet Operation - The sound-reducing design minimizes the operating noise and allows the unit to sew with less vibration. LED Sewing Light - The needle area is brightly illuminated, making serging less stressful on your eyes. Waste Collector - Provided as a standard accessory, the waste collector catches cut-off fabric. Convenient Threading with the Easy Threader - Using the new easy threader feature, easily thread the machine from the threading hole to the looper with the power of a strong whoosh of air sent from the electric motor. This amazing function dramatically alters upper and lower looper threading. Automatic Needle Threader - Quickly thread the needle! With the automatic needle threader, the needle is threaded in 3 easy steps. Juki sergers have a 2 year electronic warranty on motors, light assembly, wiring, switches, circuit boards, and speed control. A 5 year mechanical warranty covers "all other parts"; however this excludes "consumable parts" such as loopers, feed dogs, knife blades, bulbs, lamps, presser feet, needles and belts. Juki sergers also come with a 90 days labor period on adjustments, good through the Juki dealer from which the machine is originally purchased. This warranty is valid only on products used for household purposes. Using this product in a commercial environment voids the warranty.